The D-Link xtreme N PCI express desktop adapter (DWA-556) connects your desktop computer to a high-speed Wireless N300 network so you can enjoy steady streaming media and online gaming from greater distances across your home or office. Ideal for larger homes and offices, the Xtreme N Desktop PCI Adapter boasts three external antennas to provide superior Wi-Fi reception for unrivaled wireless performance. 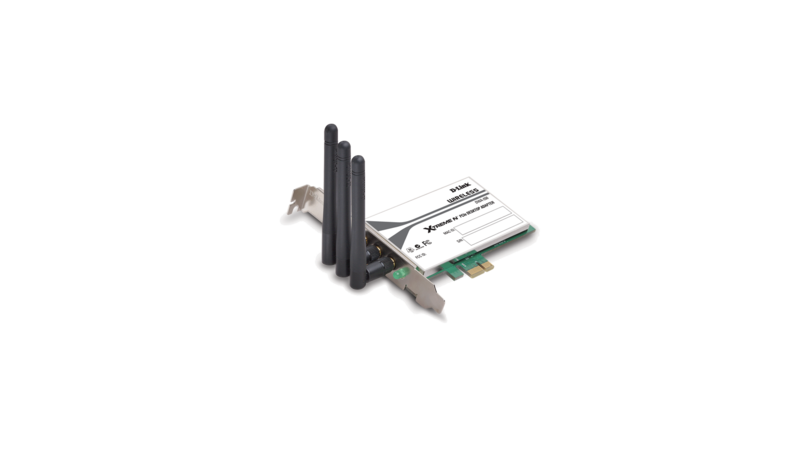 The D-Link xtreme N™ PCI express (PCIe) desktop adapter (DWA-556) is a 802.11n wireless client that delivers unrivaled wireless performance for your PCI Express-enabled desktop computer. The PCIe interface provides superior performance over a standard PCI interface. This wireless adapter delivers up to 14x faster speeds* and 6x farther range* than 802.11g while staying backward compatible with 802.11g networks. Once connected, you can share a high-speed Internet connection, photos, files, music, videos, printers, and storage. The xtreme N PCI express desktop adapter is powered by xtreme N technology and boasts three external antennas to provide superior wireless reception in your home or office. This adapter is designed for use in larger homes and offices, or for users running multiple bandwidth-intensive applications. This adapter enables you to simultaneously make or receive Internet phone calls (VoIP), surf the Web, transfer files, and stream High-Definition (HD) media when connected to an Xtreme N Gigabit Router*. The DWA-556 supports WPA™ and WPA2™ encryption that allow you to connect securely to a wireless network. D-Link's quick adapter setup wizard guides you step-by-step through the installation process. Configure this desktop adapter without having to call a networking expert to help you. With unmatched wireless performance, reception, and security, the D-Link Xtreme N PCI Express Desktop Adapter (DWA-556) is the best choice for easily adding or upgrading wireless connectivity to your PCI Express-enabled desktop computer. Connects your PCIe compatible desktop computer to a wireless network to access a high-speed Internet connection, transfer files, and stream media from greater distances around your home or office. 1 When used with the DIR-655 Xtreme N Router. Maximum wireless signal rate derived from IEEE Standard 802.11g and 802.11n specifications. Actual data throughput will vary. Network conditions and environmental factors, including volume of network traffic, buildings materials and construction, and network overhead, lower actual data throughput rate. Environmental factors will adversely affect wireless signal range. Wireless range and speed rates are D-Link RELATIVE performance measurements based on the wireless range and speed rates of a standard Wireless G product from D-Link. Maximum throughput based on D-Link 802.11n devices. 2 Maximum throughput and performance derived from PCI and PCI Express specifications.